Acne is caused when oil secreting sebaceous glands and hair follicles in the skin are blocked due to hormonal, and sometimes genetic influences. The obstruction leads to an increase in bacteria, known as P.acne, in the glands. The glands then become inflamed, causing blemishes such as black heads, spots and pimples to appear. The most common manifestation is facial acne, however back acne can also be an embarrassing issue for some patients. In some cases, acne can lead to scarring which is difficult to treat with home remedies and acne scarring creams. The good news is that there are many non-surgical and clinically effective ways to treat acne scarring. What treatment is available to treat active acne? We aim to manage the majority of our patients using creams and various treatments, avoiding the need for oral medication. However in some resistant cases, stronger medication may be required. In recent years, the amount of treatments available for acne sufferers has increased. 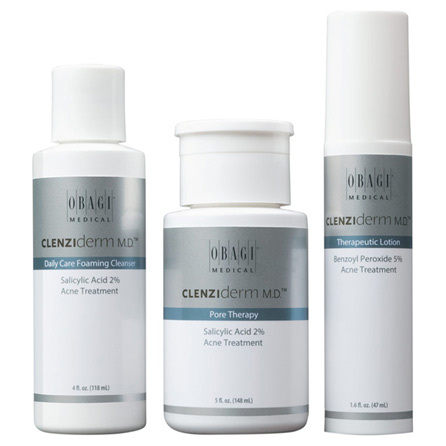 The Obagi ClenziDerm is a medicated range of products designed to target acne-prone skin. It contains high levels of active ingredients, such as benzoyl peroxide and salicylic acid, which penetrate deep into the problem areas. The cleanser, toner and moisturizer can be used daily to help clear breakouts and prevent them from returning. The salicylic acid helps unclog pores, remove dirt and debris, while benzoyl peroxide eliminates bacteria on the skin surface. The formula also helps remove excess oil without stripping the skin of its essential moisture. The kit contains Obagi CLENZIderm MD Daily Care Foaming Cleanser, Obagi CLENZIderm MD Pore Therapy and Obagi CELNZIderm MD Therapeutic Lotion BPO 5%. Try out the Obagi CLENZIderm M.D. Acne Therapeutic System for Normal to Oily Skin to get back a clear complexion. Dispense a dime-sized amount of Daily Care Foaming Cleanser into the palm of your hand. Lather and gently massage Cleanser over the entire face for at least 20 to 30 seconds; avoid getting Cleanser in your eyes. Rinse the skin thoroughly and pat it dry. Wait 10 to 15 minutes to allow skin to dry completely before applying Pore Therapy. Following Step 1, moisten a cotton ball or pad with Pore Therapy. Apply Pore Therapy over entire the face; avoid getting it near your eyes or in the nose and mouth. Allow Pore Therapy to air dry on the skin—do not rinse off. Make sure Pore Therapy has dried thoroughly. Apply 1 pump of Therapeutic Lotion to your fingertips. Apply evenly to the entire face; avoid getting near your eyes or in the nose and mouth. Wash your hands after applying but do not wash medication off the face. People with sensitive skin may feel temporary tingling or stinging during the first week of usage, which can be minimised by reducing the frequency of application. The Therapeutic Lotion contains benzoyl peroxide, which may bleach hair or dye fabric. The CLENZIderm M.D. System provides visible reductions in acne lesions in as little as 1 week.